One of my favorite books of all time is Gödel, Escher, Bach. I was lucky enough to take a course based on this book in highschool. GEB is a treatise on reality and consciousness thru parable, art, math and music will reteach you how to see the ever-expanding, self-referential world. "In some of his drawings, one single theme can appear on different levels of reality. For instance, one level in a drawing might clearly be recognizable as representing fantasy or imagination; another level would be recognizable as reality. The two levels might be the only explicitly portrayed levels. 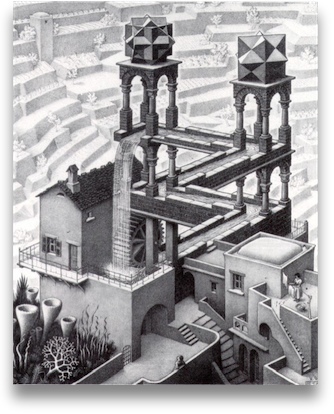 But the mere presence of these two levels invites the viewer to look upon himself as part of yet another level; and by taking that step, the viewer cannot help getting caught up in Escher’s implied chain of levels, in which, for any one level, there is always another level above it of greater "reality", and likewise, there is always a level below, "more imaginary" than it is. This can be mind-boggling in itself. However, what happens if the chain of levels is not linear, but forms a loop? What is real, then, and what is fantasy? The genius of Escher was that he could not only concoct, but actually portray, dozens of half-real, half-mythical worlds, worlds filled with Strange Loops, which he seems to be inviting his viewers to enter."